The male tiger found dead in Bandhavgarh on Friday afternoon had come in contact with an electric trap that poachers set up for a wild boar, forest officials probing the death of the big cat have revealed. The key detail came to light during the questioning of four poachers – Tejwan, Khelan, Janpad Gour and Dhanurdhari – who were nabbed by the forest department from Karondiya village on Sunday. The leader of the poachers’ gang, Shoukhilal Jaiswal, was still absconding, the officials said. The tiger’s carcass was found at Karondiya on November 4. According to principal chief conservator of forest (wildlife) Jitendra Agarwal, the poachers admitted they had already killed one wild boar on October 27. “During the interrogation, poachers said they had laid electricity wire up to 2 kilometers with an intention to kill wild boar once again on the next day of Diwali. The tiger crossed the wire, but his tail touched it killing him instantly. The poachers further said they had no intention to kill the tiger. In nervousness, they took the carcass and threw it at a distant place,” Agarwal said. Joint director of Bandhavgarh Tiger Reserve BB Bangar said that at the first sight they thought it was a natural death because all the limbs of the tiger were intact. “But we suspected tiger’s death due to electrocution after we found blood clotting in his heart in the autopsy report. During the search, we found small pieces of wire in an agriculture field and marks of peg, which made it possible to arrest the culprits,” he said. 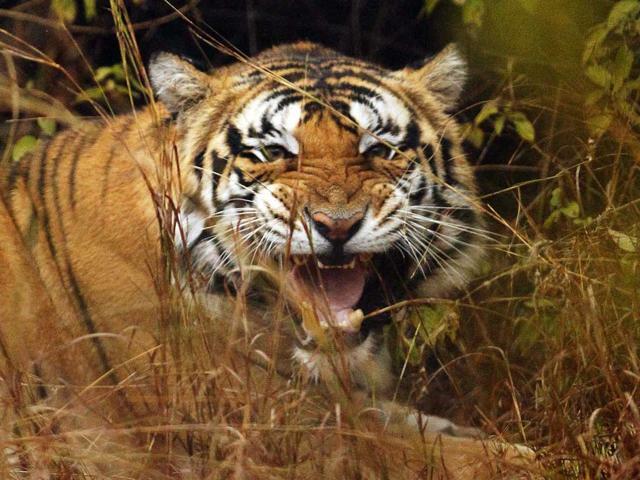 It was the fifth tiger death in Bandhavgarh this year. Bandhavgarh reserve, located between the Vindhyan and Satpura ranges in Umaria district, has one of the highest tiger densities in the country.